One of the best things about being a mortgage lender is sharing in the excitement clients experience when their home ownership dreams come true. 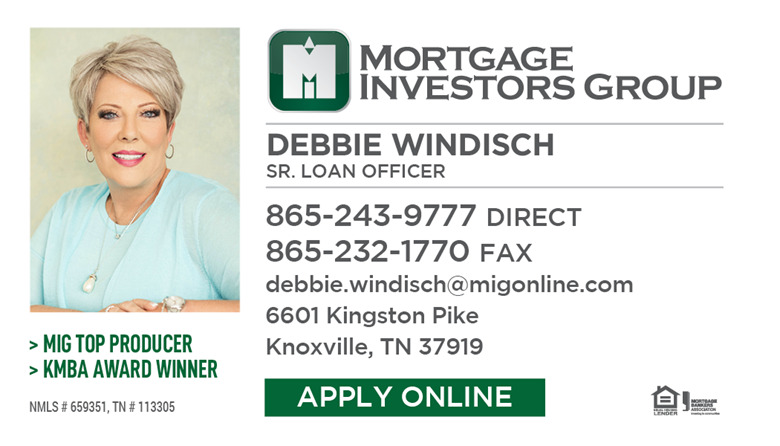 As a Senior Loan Officer at the Bearden Office in Knoxville, Tennessee, I focus on building lifelong relationships with my customers, whether they are first-time buyers, move-up buyers or are refinancing an existing loan. I have worked in the mortgage lending business since 1983; so I have a solid understanding of the local real estate market and the expertise to help clients find the best loan program for their needs. As a licensed mortgage loan originator, I enjoy working for a locally owned company that values its customers and is dedicated to providing courteous and professional service while closing loans in a timely and efficient manner. I am a member of The Women’s Council of Realtors and the Knoxville Mortgage Bankers Association, which has recognized me with it’s Platinum Award in 2016, Gold Award from 2015 to 2013, Silver Award in 2012, and Bronze Award in 2011*. I look forward to assisting you with your current or future mortgage loan needs. Being the Greater Knoxville area’s top selling real estate team, the Holli McCray Home Marketing Group understands how to buy and sell homes at a high level. We have an expert staff that allows us to provide each of our clients with excellent customer service and guidance. Our focus is on professional consultations, personalized strategies, powerful negotiations, and proven results. HMG is able to quickly adapt to changes in the market and grasp new technologies that allow us to sell homes faster and for more money. As a result, we consistently sell hundreds of homes per year.